All quantities are approximate, by the way. Put 3 Tbsp of oatmeal, 1 Tbsp chia seed, 2Tbsp hemp hearts in blender & whiz up until it's a bit like coarse flour. Add about a cup of soy milk (or any other kind of milk) & blend again. Toss in three kale leaves--I don't even bother cutting off the stems--blend well. Next add about 2 Tbsp of peanut butter & blend, adding a bit more milk at any point if too thick. Toss in a banana in chunks & a cut up apple (this is a great way to use up bruised fruit). I don't even peel the apple--more fibre & vitamins, right? 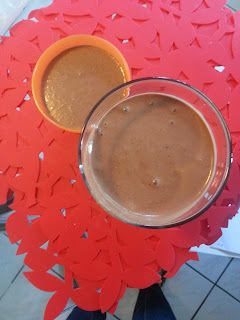 Last, but definitely not least: blend in COCOA powder! Maybe 2 Tbsp? This made about 750 mL of smoothie, which is just perfect for me & Sprout. The banana & apple have enough natural sweetness that I didn't add any honey or sugar. The oatmeal, chia & peanut butter give this smoothie a milkshake-like consistency--which you can 'water down' with more soy milk or ice or water. Another fab option, especially for summer, is to use frozen bananas. Using cocoa powder completely hides the greenish tinge from the kale, by the way. You can't taste it either. So if you have a child who's suspicious of greens, this is a brilliant way to sneak them in.